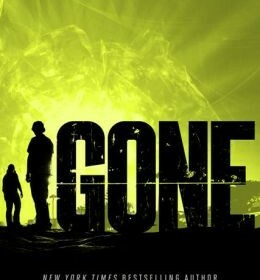 Gone, by Michael Grant, is the enrapturing story of the FAYZ (Fallout Alley Youth Zone) and one normal teenager’s epic struggle to keep balance in a crumbling society. Sam Temple was just an ordinary kid in a small seacoast town called Perdido Beach, California. Sam never really stuck out to anyone. He didn’t care about school or grades, all he wanted to do was surf and have fun. Until one day, everyone disappeared. Sam was sitting in class with his friend Quinn when it happened. Their teacher just disappeared, vanished in front of their eyes. Quinn and Sam soon discover that Perdido Beach had been surrounded by a mysterious glowing barrier. Most of the remaining population of Perdido Beach suspect it has somthing to do with the radiation accident that occurred at the Perdido Beach Power Plant 6 years ago. Kids are taking sides between the town and the mysterious private school, Coates Academy. Many people are developing strange powers, causing unexplainable accidents that seem to rewrite the laws of physics. Soon Sam, Quinn and their new friend Astrid discover that all people over the age of 15 had disappeared, and on their 15th birthday they will disappear as well. Michael Grant draws his writing style from many different areas. He includes a large amount of mystery and suspense in his writing, and through that, Gone has a great feel of encouragement to read on. The emotion expressed through this book will connect to anyone who has faced loss of loved ones. A feeling of emptiness is ongoing throughout the entirety of Gone. I would recommend Gone to mostly teenagers and kids because of the many connections that they will draw from the characters. The naive nature of some of the characters will feel familiar to many people who can connect these characters actions to their actions when they were younger. Adults who have read Lord of the Flies would find this book interesting at the very least, but might not take too it’s unrealistic setting. Overall I would recommend this book highly to teenagers, and less highly to children due to the very rare gruesome moments in the book. Michael Grant has put together a very engaging story with Gone. From beginning to end I was interested by how the different characters interacted with each other and how they would react to the different situations throughout the book. The relationship between Quinn and Sam was especially emotionally stressing. Overall Gone’s great setting and characters make up for it’s lack of backstory.